If you wondering when your local cafe, supermarket, and shopping mall would stop playing “Santa Baby,” rest assured: Christmas is almost here! Though my own family is Jewish, the holiday still holds so many sweet memories for me: the evening I gathered all the ornaments given to my mother by her elementary school students and decorated a cardboard box; the year I went to the movies to see Life is Beautiful with my friend Alli and about 35 octogenarians; and yes, the time my family saw a musical version of A Christmas Carol (we won tickets) while my hand swollen from a broken wrist. Alas, sustained grinching is the most effective way I’ve found to navigate the month-long flood of specials, ads, and jingles that Christmas brings. Somewhere beneath my Scrooge-ish demeanor, I do though have an affection for holiday films like the Muppet Christmas Carol and a larger fascination with a popular culture I do not share. 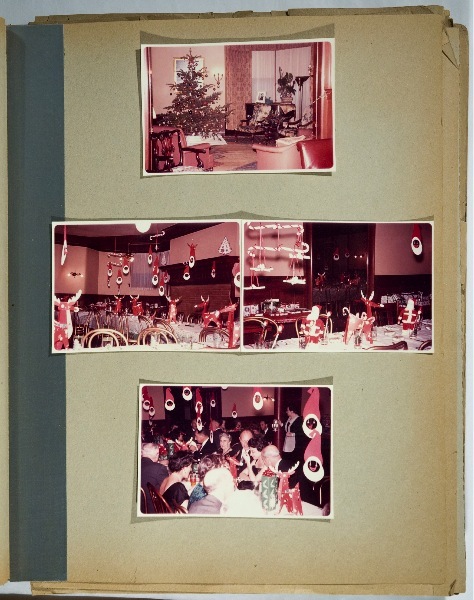 Take for example, the Christmas artifacts in the reliable Duke Digital Collections. Their Ad Access archive, for one, includes this randy 1943 pitch for war bonds (on the left), and this adorable 1956 ad for Packard-Bell TV sets (on the right). Over in their Protestant Family Archive you can also check out this 1936 article from The Christian Home by a mother wrestling over whether to tell their children about Santa Claus or not. 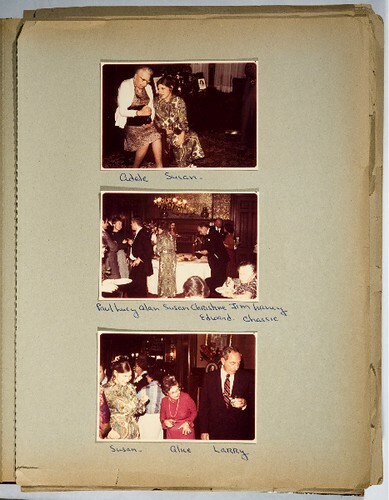 For something less expected, surf over to check out the Magnes Museum‘s digitized scrapbook of what was an annual San Francisco event: the Christmas parties held at the Haas Lilienthal House—as the archivist notes, an unusual window into California’s “Jewish aristocracy.” Here are two images from the book below. And why not surf over to the vast Museum of Broadcast Communications Archives where you can discover the ghosts of Christmas TV past, including a Liberace special and another starring Judy Garland. Yes, that’s one holiday, two gay icons! On that note, this is the Lazy Scholar signing off for 2009. I’ll return after a short sabbatical on Monday, January 11, 2010! Happy holidays to all, and thank you as always for reading. i’m a *huge* fan of duke’s hartman collection digital archives!! when your time allows, check out the feminine hygiene ads. entertaining AND educational!